Here is another classic from my personal video collection. This one is a really cool VHS promo tape that Yamaha used to send out in the mail in the days before internet video was common. This one is for the 1995 Yamaha YZ lineup and features Factory riders Jeff Emig and Mike Craig, as well as amateur star Justin Buckelew. 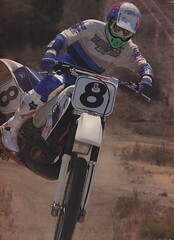 Practicing on Bartlett’s Supercross track in 1994.